Gifts to the Annual Fund help provide critical, unrestricted operating funds that allow us to maintain a balanced budget, minimize tuition increases, enhance the overall quality of the student experience and support our mission of excellence. Support and improve extra-curricular opportunities and athletics. 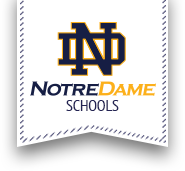 Offer tuition assistance to keep Notre Dame accessible and tuition affordable. And most recently, to purchase classroom iPads to create hands-on, customizable learning experiences. Use the form below to give. Or click here to open the form in a new window.